To intelligently conduct a long-standing campaign that successfully positions Dishoom as a leader in the UK contemporary dining scene. To clearly communicate Dishoom's values of cultural diversity, strong sense of charity and their role as a ground breaking restaurant brand through their story telling, attention to interior design, cultural events and celebrations. We announced the launches of three new London sites over four years and positively promoted Dishoom’s shift from a single restaurant to a national respected brand. Dishoom gained a reputation for hosting some of the best launches in the industry, with customers queuing around the block during their soft launch period. Through design tours and tastings with the Dishoom team, journalists experienced each individual story behind the different sites. Dishoom’s cultural events and release of their very first music album with the opening of Dishoom Carnaby enabled us to communicate Dishoom as a pioneer and secure key features in national and international titles. 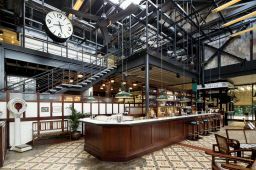 Dishoom has been featured in trade, lifestyle, design, consumer and travel titles consistently, and has topped the Yelp poll as ‘best restaurant’ consecutively in 2015 and 2016. Carl Brown, Dishoom’s Bar Manager was awarded the Young British Foodie Award for the alcohol category in 2014, and Dishoom has been listed in the National Restaurant Awards and included in Cool Brands annual guides.